In an early episode of Mad Men, Betty Draper jumps a curb with her kids, a boy and a girl, in the car. 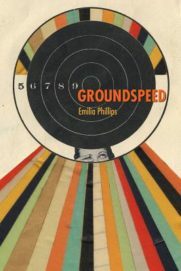 In the aftermath, she expresses regret thusly: “If it happened to Bobby it would have been okay because a boy with a scar is nothing, but a girl, it's so much worse.” In the opening poem of Groundspeed by Emilia Phillips, “Reading Ovid at the Plastic Surgeon’s,” the idea that we might consider ourselves too intelligent for vanity collapses beneath our collective weight. The speaker waits to be called for a procedure to remove cancerous cells from her face, quite rightly feeling fear, but first distinguishing herself from the other patients: “No one else with a book, the slick / weeklies gossip amongst // themselves on the side / tables” while a television displays a stock market dip and “a profile of the marathon // bombers.” Clearly, she believes her choice of Ovid as her means of distraction sets her apart, and she seems to assume some of the other patients are there by choice rather than medical necessity. What’s interesting here is that certainly the speaker bears some measure of vanity herself, worried about the “hunk of my // cheek (cancer)” to be removed, dissociating from the experience by imagining the incision “site as an apricot, bitten.” She describes the image as personal “romanticism,” though, like the Ovid volume, it is also a coping mechanism. The photographic negative of this poem is one I recall by Maura Stanton that describes a student with cancer riding the elevator in Ballantine Hall at IU-Bloomington, and the cheerful assumptions her fellow riders make about her based on her engagement ring. We can’t tell when someone else is ill, and, if given the choice, would probably prefer not to know when we are either. In the final lines of the poem, Phillips’s speaker refuses to look at her own reflection in a window on the way into the exam room. By the time we reach the final poem in the collection, “Supine Body in Full-Length Mirror, Hotel Room, Upper West Side,” the speaker no longer avoids her image, instead looking directly into the mirror and boldly inventorying her body, pausing at “the blot // where your aureola was once / pink.” She reflects on the events chronicled in the flesh, scars, like tattoos sometimes do, summarizing traumatic narratives. At first, she is surprised that it (her body) has come to the hotel with her. (Who invited you?) She goes on to position her body as symbolic, an assemblage constituting a lifetime of freighted modalities of gender. Its meaning constituted through its wounds, it suggests that meaning is a wound. And perhaps this is more true for bodies read as female than for those read as male. We don’t always have the benefit of knowing our wounds very well, and Phillips compares the animal world to ours: “doves they released // over your brother’s grave wear / symbolism like buckshot // in the breast / unknowingly.” The birds don’t know they’re at a funeral. They don’t know what they symbolize. What we know, we know because we have been wounded. And we have the memory of that experience as well as the scar to remind us, whereas the symbolism of the doves stays lodged beneath the surface “like buckshot.” Like Phillips’s speaker, we have to choose to face the experiences and ourselves. So much more is at play and at stake in this collection beyond these two bookending poems—death, travel, coming of age, all of which Phillips leads the reader through, not gently exactly, but with such reassuring competence as to make these potential dangers manageable, less threatening than if faced on our own. This entry was posted in Uncategorized and tagged Fall 2017 on November 8, 2017 by Kelly.